Well located 2 bed, 2 bath townhouse in Fourways. 1 of 25 - Garden and view of townhouse. 2 of 25 - Kitchen. 3 of 25 - Kitchen. 4 of 25 - Dining area. 5 of 25 - Lounge. 6 of 25 - Lounge. 7 of 25 - Downstairs lounge area. 8 of 25 - Front door and guest loo. 9 of 25 - Entrance hall. 10 of 25 - En suite bathroom. 11 of 25 - Main bedroom. 12 of 25 - Main bedroom. 13 of 25 - 2nd bathroom. 14 of 25 - 2nd bedroom. 15 of 25 - 2nd bedroom. 16 of 25 - Upstairs landing. 17 of 25 - Upstairs landing. 18 of 25 - Large loft area suitable as a study..
19 of 25 - Loft study area. 20 of 25 - Patio and garden. 21 of 25 - Garden. 22 of 25 - Garden. 23 of 25 - View of the townhouse from the garden. 24 of 25 - Front view with front door. 25 of 25 - Open plan lounge. 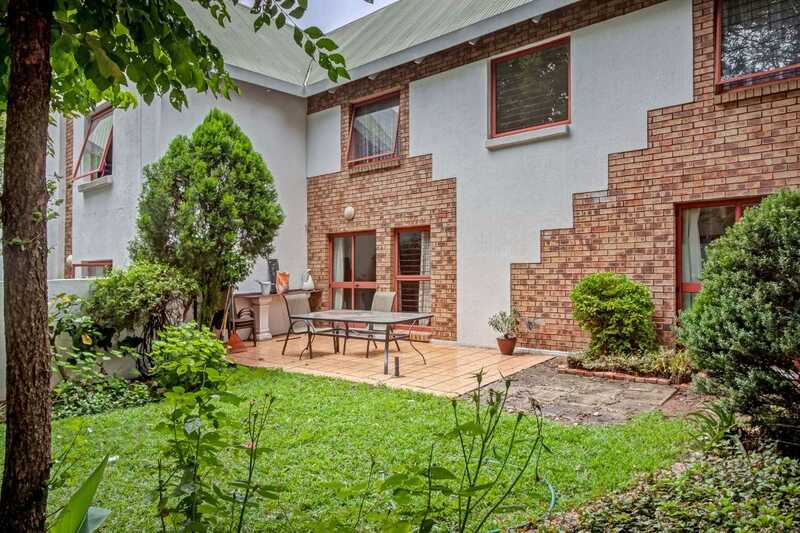 Well situated townhouse in the heart of Fourways with spacious, open plan living area, designed for easy living and entertaining. Newly renovated, fitted kitchen with luxurious finishes, breakfast counter and space for 2 appliances. Private courtyard with wash line. Upstairs features 2 well-sized bedrooms both with BIC and bathrooms (MES), plus large loft room on 3rd level, suitable as 3rd bedroom or studio/study or storage. Sizeable well established garden suitable for 2 small pets. Very secure. Communal Pool. Part of the newly formed Fourways Precinct, close proximity to top schools, shopping centres, Life Fourways Hospital, Lanseria International Airport and major routes. Pets Allowed: 2 small pets. Entrance: Entrance opens into a small entrance hall leading into the open plan living area.